A new boutique entertainment center with a bowling alley, live music, restaurant, bar and private event space will open in the fall of 2018 in the Electric Depot, a mixed-used development planned for the old Entergy site at 1509 Government St.
Other buildings at the site will house a healthy living center with yoga, cycling and healthy foods, as well as a microbrewery and pizza parlor; another building will provide a mix of residential, office and retail space. Development team Weinstein Nelson announced the new entertainment tenant—currently going by the working title of Red Stick Social, though that’s subject to change as the brand is developed and refined—earlier today. 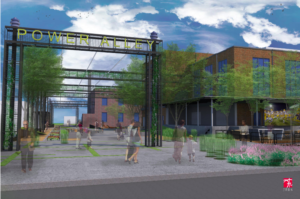 “We’re really excited about the opportunity to utilize this historic site to create something revolutionary for Baton Rouge,” says architect Dyke Nelson, who is leading the development team. 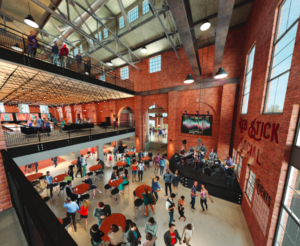 The entertainment center will be developed in building A on the roughly six-acre site on which the Electric Depot sits. Robert Lay, who is working with a team to make the venue a reality in Baton Rouge, says the facility will offer WiFi and state-of-the-art audio/video systems. A customer-centric digital presence will enable customers to reserve lanes, schedule private events, and purchase tickets to live performances. Customers will have the ability to order food and beverages onsite from their smartphones or WiFi-enabled devices. Lay has been searching for the right location for the entertainment venue for three years, looking at former big box stores and other sites throughout the city. He says he met with Nelson about a year ago, explaining the concept to the architect. Lay says he intends to give Baton Rouge a socially-engaging environment where people can socialize in a comfortable and collaborative setting. “What we want to create is literally an environment that touches all walks of life,” he says, adding that the venue will will be designed to attract children’s birthday parties and business meetings over coffee alike. And at least three nights a week, the center will transition into an adult space with live music. 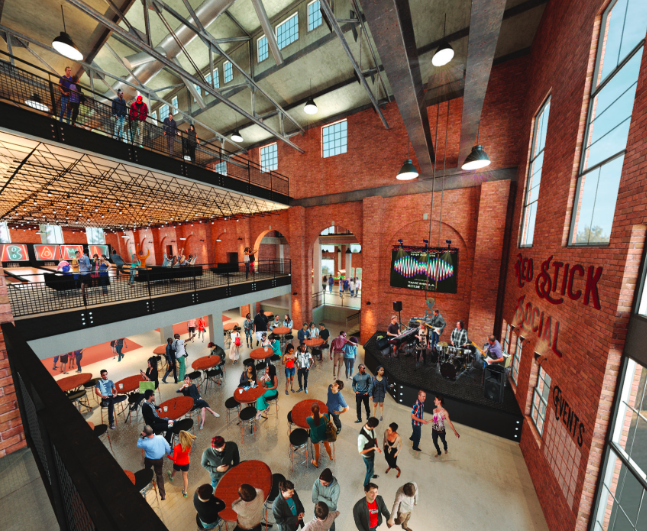 Red Stick Social is the first announced tenant in Electric Depot. The development comprises 50,000-square-feet of retail and office space, and 16 one-bedroom apartments that will rent for $950. Three of the units will be rent restricted, going for about $650 to $750 per month. The development site will be fully landscaped with new sidewalks on Government Street, a bus stop and a central lawn for public events. It will also offer more than 200 parking spaces. The first phase is set for completion by the end of 2018; a subsequent phase involving additional residential, retail and office still is being finalized. In April, Nelson secured approval from the Planning Commission to rezone the site to accommodate the microbrewery and pizza parlor. About 12,000 square feet of retail and office space is in Building B is currently available. The Weinstein Nelson development team includes Garrett Temple, Anthony Kimble, Helena Cunningham, Todd Stevens and Matt Saurage, along with Jennifer Jones and Dennis Blunt with Shiloh Baptist Foundation. It was selected last summer by the East Baton Rouge Redevelopment Authority to redevelop the site. View more renderings of the project.